Contact us directly if you have any questions about selling or purchasing a home in Hyde Park. Listed Below Tax Appraisal For Quick Sale. Remodeled Interior And Exterior: Updated Wood Floors, Kitchen Cabinets, Bath, Laundry Room, Fencing, New Paint Inside And Out. Cute House In Desirable Hyde Park. Can Be 3/1 Or 2/1 With Office. Ready For Immediate Move In With Added Square Footage Possible Now Or Later. The neighborhood is located in the heart of the city, a short bike ride or bus stop away from The University of Texas, and in walking distance to streets lined with restaurants, coffee shops, yoga studios, clothing boutiques, hair salons, gyms, bakeries, and grocery stores. Residents can easily access I35 close to Hancock Center, making for easy access to downtown and south Austin employers. The close proximity to Austin’s downtown entertainment district and major highways often make Hyde Park one of the first places people look for an Austin home for sale. The Hyde Park neighborhood association keeps a close eye on the neighborhood’s development, and allowance of new construction is dependent on a builder’s plan to maintain the character of the area’s history. Several homes enjoy tax breaks through their recognition of historical status. Hyde Park is bordered by 38th Street to the south, Guadalupe to the west, 51st street to the north, and Red River to the west. It is approximately four miles from Downtown Austin, which can be reached by either Guadalupe or I35, both routes taking 10-15 minutes, depending on the time of day traveling. Biking to downtown is also easy and sometimes quicker than taking a car. This speedy commute makes the 78751 zip code a desirable address (see 78751 homes for sale). Hyde Park is only about one square mile in length, but within its borders are enough local businesses and beauty to attract people from throughout the city. In the center of the community is Shipe Park, with a playground, basketball courts, grassy open space, two tennis courts, and a pool. The Shoal Creek Trail is also accessible from Hyde Park, running behind North Lamar Boulevard and flanked by rocky bluffs and trees. Shipe Park is located close to the Elizabet Ney Museum, the home of a celebrated sculptor who came from Germany to make her home in Texas. Other historic buildings in the neighborhood include the Baker Center, an historic school now owned by the Austin Independent School District and utilized for professional development, the Austin State Hospital, Blue Bonnet Court, the Col. Monroe M. Shipe House, the Hildreth-Flanagan-Heierman House, the Frank M. and Annie G. Covert House, the Page-Gilbert House, the Smith-Marcuse-Lowry House, the Oliphant-Walker House, and the Peter and Clotilde Shipe Mansbendel House. East of Hyde Park is the Hancock Golf Course, an 8-hole public course. Established in 1899, the course is the oldest golf course in the state of Texas. The par 35, 9-hole course carries up and down hills and over beautiful Waller Creek. The old course is relatively short by modern standards, featuring small, well-manicured greens that are typical of the era in which it was built. At the neighborhood’s western edge, Guadalupe Street hosts locally-owned mainstays like Hyde Park Gym, an iconic Austin business known for its muscled arm and dumbbell protruding from the storefront. Dharma Yoga is in walking distance of the neighborhood. Hyde Park also has its own Fire Station, Post Office, laundromat, and a large collection of churches, ranging from small congregations like the Hyde Park Presbyterian Church to the large Hyde Park Baptist Church, which enjoys high scholastic rankings for its Hyde Park Baptist School. Hyde Park contains and is located close to several popular shopping centers that are primarily comprised of local businesses, including restaurants, bars, coffee shops, grocers, and retailers. The Avenue B Grocery Store, one of the hidden treasures of the neighborhood, is Austin’s oldest operating grocery store, built in 1909. Offering a small but well stocked selection of grocery items, the store, in its original wood frame building, is known for its deli sandwich counter and picnic seating, as well as the owner’s tendency to keep store hours based on the weather. The “Village” of Hyde Park, on 43rd in Duval, contains Fresh Plus, the neighborhood grocery; Asti Trattoria, an Italian eatery; Dolce Vita, featuring gelato, gourmet foods, and infused cocktails; and Hyde Park Bar and Grill – famous for its pepper-battered fries. Quack’s Bakery also shares space here, as does Antonelli’s Cheese Shop. Mother’s Café, a popular vegetarian restaurant, is across the street. Just down the road, thirsty Austinites can find the Daily Juice Café, offering fresh squeezed juices and vegan cuisine, as well as a vegan ice-cream parlor, Sweet Ritual. Hancock Center, located just off I35, is home to the largest HEB grocery store in the state. According to a produce buyer for HEB, “If it’s not in that store, HEB doesn’t carry it.” Hancock Center also has a Pets Mart, Sears, Lifetime Fitness, and several smaller restaurants and stores. The Triangle, located caddy corner to Hyde Park, is a new condo, apartment, and business development that houses Snap Kitchen, Galaxy Café, Chedd’s Gourmet Grilled Cheese, Mandola’s Italian Cuisine, Maoz Vegetarian, Mama Fu’s, The Flying Saucer, Which Wich, How Do You Roll, Yogurt Planet, and The Barn Door Grocery. A farmer’s market also is held in the center’s commons every Wednesday night. 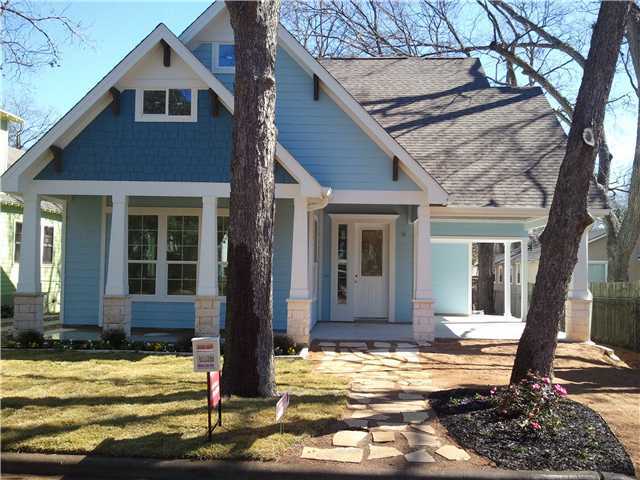 Hyde Park is in the Austin Independent School District (see Austin ISD homes for sale). Lee Elementary (Rated exemplary. See Lee Elementary homes for sale). Kealing Middle School (Rated academically acceptable. See Kealing Middle School homes for sale). McCallum High School (Rated academically acceptable. See McCallum High School homes for sale). Residents of Hyde Park may elect to participate in the Hyde Park Neighborhood Association.